I have a folder on my Instagram saved 'places to visit' but wasn't sure if the photos of Llanddwyn were highly edited to look awesome. It really is as beautiful as the pictures with cute little gates and paths made of white shells. Legends say it was the final resting place of the Welsh saint of lovers, it certainly had a magical and romantic feel to it. To visit, you do need to check the tide times. High tide isolates the island from the mainland, so don't lose track of time! 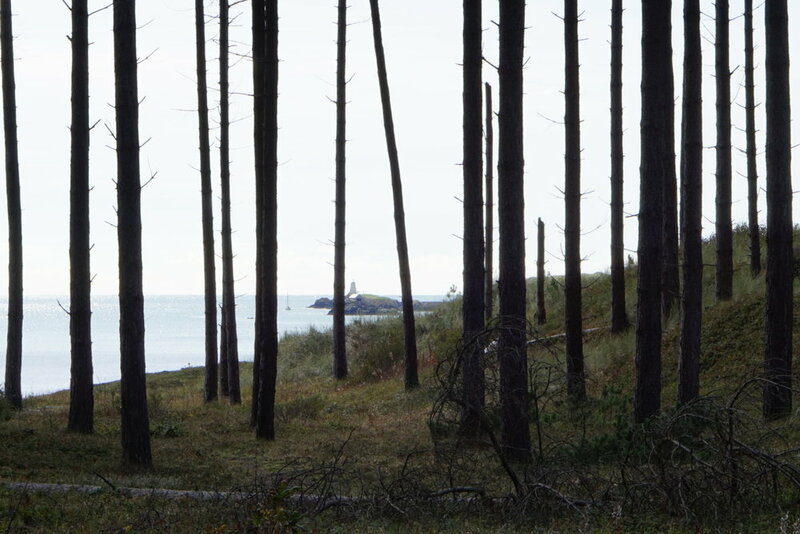 We parked at Newborough beach (LL61 6SG) and followed the path through the forest just behind the beach. You can just about see the lighthouse on Llandwyn through the trees. There are a couple of old pilots cottages on the island but we couldn't go any closer for a nosy on the day we visited because of filming going on. It's only a mile from the car park to the island if you walk along the beach. We gave ourselves an hour each way to walk through the forest with a baby strapped to one of us and then stopping on the main beach for Milo to have a swim on the way back. At only 11 weeks old, it was Emlyns first visit to a beach, not a bad one to start! Let's hope he doesn't set his standards based on this award winning one with its crystal clear sea and clean sands (sorry Emlyn, our closest is probably Talacre and you're not going for a paddle there!). The beach below is on the left as you come off the island: Golden sands, completely empty, the perfect place for a picnic. There are also lots of small coves on the island itself. Have you been? If not, you must! I hope you love it as much as we did.